Q: Lewis, congratulations, tell us your emotions right now. Does this make up for Monaco? Lewis HAMILTON: I love Montreal. I love this track; I love the city and really just a fantastic weekend and great to get back on the top step. For me personally and I'm sure I'm speak for the team, I want to dedicate this to my engineer Bonno's [Pete Bonnington's] father, who I know it's been a tough weekend for him but he has been amazing all weekend and he helped me win this today and this is really dedicated to him. Q: It was hard out there; it was hard-fought. It might not have looked it but tell us how close it was, how tough it was with Nico and what you had to handle in the car? Hamilton: I didn't feel happy or the most comfortable, I generally had a lot of understeer but I never really felt too much under pressure. Nico was quick but I felt like I always had it under control, I had a bit of time in my pocket to be able to pull it out when I needed to, so it was never too serious. But it was a great race. I don't know how it was to watch but it felt like it was intense and I really enjoyed it. Q: And tell me: you're back in business now, do you feel you needed this after Monaco? Hamilton: Did I need this? I think so. I think so. Again, just a big thank you to all the fans today. Every time we come here we have the most incredible support from all the fans, so I just take my hat off to you guys. Q: Thank you very much Lewis. Nico, coming to you: great race, you were struggling with all sorts of things; the team was telling you to save brakes and save fuel sometimes. How close was it? Nico ROSBERG: Yeah, it was a good race against Lewis. I was pushing like mad to try to put the pressure on but he didn't make any mistakes, so fair play. It was a challenging race, yeah, because we had to manage fuel, brakes, all these things, but it was the same for Lewis, the same for both of us. It was a good race. Unfortunately I couldn't make it happen but second place is still OK.
Q: Well, you say it's still OK but it is another second place. You were coming off a couple of good races for you. Where have you been lacking this weekend do you feel? Rosberg: It was just that tiny bit I lost out qualifying in the end, because the race pace was there and just that qualifying position makes that big difference. That's what I need to try and make happen the next time. Q: Valterri, coming to you: Williams' first podium of the season, it must be a great result for you and everybody from Williams? Valtteri BOTTAS: Yeah, really happy for us as a team, really proud. A proud member of the team and this was really good teamwork all weekend. And then the mistake Kimi made allowed us to get one position and we also changed the plan with the strategy during the race, which I thought was really dynamic, so really good job from the team and it was not a bad race from me either. Q: It must be satisfying to beat your fellow Finn Kimi Raikkonen. Now, where can Williams go from here, two tracks that should be good for you, Austria and Silverstone, coming up? Bottas: I think we really needed this result. Like last year we saw that it really boosts confidence. We know again now that we are a top team and that we can fight for podiums. I think from Austria, with the package that we have coming there, from then onwards we really hope that we can repeat at least these kind of results. Q: Thank you very much Valtteri. Lewis, final word from you. You see the flags, the crosses of Saint George, the Union flags, the flags of Grenada out there as well. What does this mean to you? Do you feel the momentum is back with you? And what are you going to do tonight, Lewis? Hamilton: Honestly, as I said, the support is incredible. Lots of British flags, people from out here in Canada supporting, Grenadian flags, Barbados flags, you know I'm so grateful. The team did amazing job and I'm really just proud to be up here and as I said, my first grand prix win was here back in 2007, so to be back up here feels really historic. Q: Many congratulations Lewis, you're fourth win here in Canada and the 37th of your career. In control really, I guess, in qualifying and the race is the best way to sum it up. Just a brief moment after the pitstop when the gap to Nico seemed to come down quite a bit, he got within DRS range of you. What was going on there? Hamilton: Well, I think because Nico was in my tow he was able to save more fuel. Naturally when you're behind someone you use less fuel. And for me, I thought I had saved enough but I needed to save some more, so through that period I was just fuel-saving. Managing the gap within a second but I was saving a lot of fuel, and then once I'd saved enough, I was able to get on it a little bit more. But I only really needed to answer to the lap times Nico would do. If I could do a tenth or two faster, that would be fine. So that's what I tried to do - just tried to manage it and bring the car home safely. Q: Nico, tell us a little about the start. There was a lot of radio messages about the brakes. So maybe you could tell us a little bit more about the management you had to do there. Rosberg: Yeah. The start was good but not quite enough to somehow try and challenge Lewis. And also tight from Kimi behind and even Valtteri I think - I'm not sure. But anyways, it all went OK and second place after that. And then yeah, a very challenging race because of fuel saving - but that wasn't so bad, more the brakes. And to adapt to the front brakes getting too hot. Adapting around that, changing brake balance, things like that. So that was the most challenging part - especially of course because I have Lewis in front, so I don't have any clean air to cool the brakes - so for me it was even more of a challenge behind. But it worked out OK. I was still able to put the pressure on but not quite enough. Q: Valtteri, welcome back. First podium of the season. 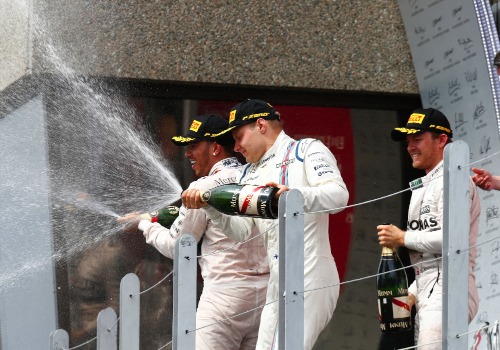 Last year from this point onwards, you and Williams went on a bit of a spree on getting on the podium. Do you see that happening again? And also, obviously Kimi Raikk‚nen spun. You and the strategy team took advantage of that. Do you think you could have done it without Raikk‚nen's problem? Bottas: That's really difficult to say really - for sure it helped us and it was good that we weren't very far away at any point in the beginning to Kimi, so we could always put a bit of pressure on them. And we also managed to change the strategy halfway of the race. I think that was really dynamic from the team. The team did really good work today with the strategy and just being aware of all the things what was happening around us and in front. Really pleased that we finally got a good result. I'm sure it's a big boost for the whole team. Q: (Mike Doodson) Lewis, very soon after you put on your second set of tyres, you had a big lock-up which we saw on the slo-mo and then later in the race you had a few more lock-ups. I wonder if you had any bad vibrations which may have affected your speed? Hamilton: Fortunately not. I didn't have really... I think right at the end I might have had one lock-up but it was never enough to be a problem. Q: (Paolo Ianieri - La Gazzetta dello Sport) Lewis, is it a relief to come back to the victory after the last two races where Nico has been catching up points, especially after Monte Carlo where you were disappointed? Hamilton: Not particularly. I don't feel I needed to be relieved. I was quickest all of the previous race weekend as well. Obviously we had the problem which enabled Nico to win the race but otherwise, generally I had good pace for the last two races so it's not a relief, it just feels good to continue with good strength and it's great that the team is continuing to be strong as well and continue to move forwards. That's probably the most impressive thing. Q: (Collin Hunt) For both Nico and Lewis: Nico, we heard you ask over the radio about Lewis's fuel levels and were told that you couldn't be told about that while Lewis was being told when he was able to lift and coast. Can both of you shed some light on how that strategy call worked from the garage? Rosberg: Yeah, I can just say my part because I wasn't to know if Lewis would run into trouble at the end of the race or not because that could help me judge how much fuel I would need to save at that point in time and when I should try and put the pressure on but unfortunately that's been banned, to give that information, so I wasn't able to get that, which is a pity, because it would have helped me judge, maybe put on a better attack if I had that information but it's the way it is, it's what they decided to do so OK.
Hamilton: I don't really know what I need to say. At the end I had fuel. I think the team was just... they wanted us to come home. I knew I had plenty of fuel at the end. There was a point where - I think about 15 laps from the end - I had enough fuel to make it to the end, even if I pushed flat out so that was good. Q: (Dean McNulty - Toronto Sun) Lewis, this is your fourth win at Circuit Gilles Villeneuve. What is it about this circuit in particular that suits your style of driving? Hamilton: You know at this circuit you need to be very attacking and you need to be quick and good on the brakes, consistent under braking and that's always been a strength for me. So I guess that's really why I've been good here all these years because braking has been one of my strengths. And also having the guts to kind of push it up as close to the wall and over the kerbs as hard as you can. I guess it's a bit like a go-kart track, so you can throw the car around. Q: (Paolo Ianieri - La Gazzetta dello Sport) Lewis and Nico, Ferrari was using a new engine here as they had used a few tokens and you haven't done that. There were a lot of questions whether they could get closer to you and we have seen that Mercedes still has a big gap. Does it make you even more relaxed that the fight for the championship is just between you two? Hamilton: I think it's pretty much impossible for you to come to that conclusion because Kimi spun so we didn't really get to see his true pace in the race. Maybe at the beginning of the race he wasn't with us and also Sebastian wasn't there and obviously Sebastian has generally been the quicker of the two so far this season so we didn't really get to see Ferrari's true pace this weekend, I think, and in the next race we will. Rosberg: Well, great to see how we're continuing to push on with the development and everything. Even though Ferrari is throwing everything at it we seem to be keeping our advantage so that's really great to see and a fantastic job from the team. Q: (Graham Keilloh) Valtteri, it was round about this point last season that Williams really stepped up to be competitive and had some really good results in qualifying. Are you confident that we'll see something similar this season? Bottas: I think the next couple of tracks, at least, will be pretty good for us. Austria, Silverstone, I think they will suit our car and I'm quite confident also with the package we have coming to Austria. At least, if it works like all the updates so far we've had, I think it should be a very good step and then possibly we could be fighting for many more podiums. I really hope it's possible.